Letting go is the feeling of floating, free from burden or worry, of simple, peaceful contentment. And you don’t get that pounding through life charged with desire for the next sofa, success or sun-drenched cocktail slammer. Constant wanting leaves you tied to the anxiety of scrabbling around rubbing your beans together to conjure up your heart’s desires. You stick in a job you hate, mortgage yourself to the hilt or hock your life with credit card purchases. You cover up your wounds and scars and battle fatigue with fancy clothes, cars, alcohol and cake. You deflect the pain of living and the baggage of the past through protest, blame and anger. You hand your power over by running from fear, anxiety and depression and your downtime simmers with hate, resentment and impending doom. Or you stop, and take a good hard look at the fact that life scares the living daylights out of you, makes you angry, guilty, apathetic, sad, full of shame and loss, and desperately clutching at your ego and its pain-deflecting desires. When I say take good hard look at your feelings, I don’t mean wallow in them or torment yourself with them or spin a self-pitying story around them. I mean look at them for exactly what they are. This is Anger. This is Grief. This is Shame. This is Fear. This is Pride. This is Desire. This is Apathy. This is Guilt. Don’t judge it, yourself or anyone else. David R Hawkins, M.D, PhD, describes these lower states on his MAP OF CONSCIOUSNESS (POWER V FORCE- The Hidden Determinants of Human Behaviour- Hawkins,  2012). He describes further in his book Letting Go, how the aim is to get comfortable with facing these destructive traits so that over time they start to diminish. Avoiding them or covering up for them or blaming others for them only succeeds in adding fuel to their fire, bubbling away like molten rock, ready to explode with full force at any moment. Instead, Hawkins explains that as you conscientiously take ownership of these undesirable feelings, you start to rise up to the higher states of consciousness. The first of these elevated tiers is courage. When you reach this place you are already able to let go of the intensity of those lower states. Your vision starts to turn outwards and upwards. You are less hounded by your shadows and fears and feel more able and willing to accept what you cannot change and be empowered to affect what you can make a difference with. As you let go of your grip on all those negative thoughts and feelings, you are more able to give love freely and unconditionally, you feel more moments of deep contentment, satisfaction, joy and ultimately a true sense of peace. You take that and you seek ways to share it, to enable others to experience it, to help them rise up from their own living hells. Gradually you begin to have a positive affect on yourself, those around you and further afield to the world at large. Things don’t bug you like they did and even when life does try to sting you with a searing side-swipe, you can deal with it, with a clear head unsullied by emotional string-pulling. What you experience is the sensation of letting go, lifting up and feeling free. Give yourself wings by letting go of what holds you down. RISE UP and FEAR LESS. 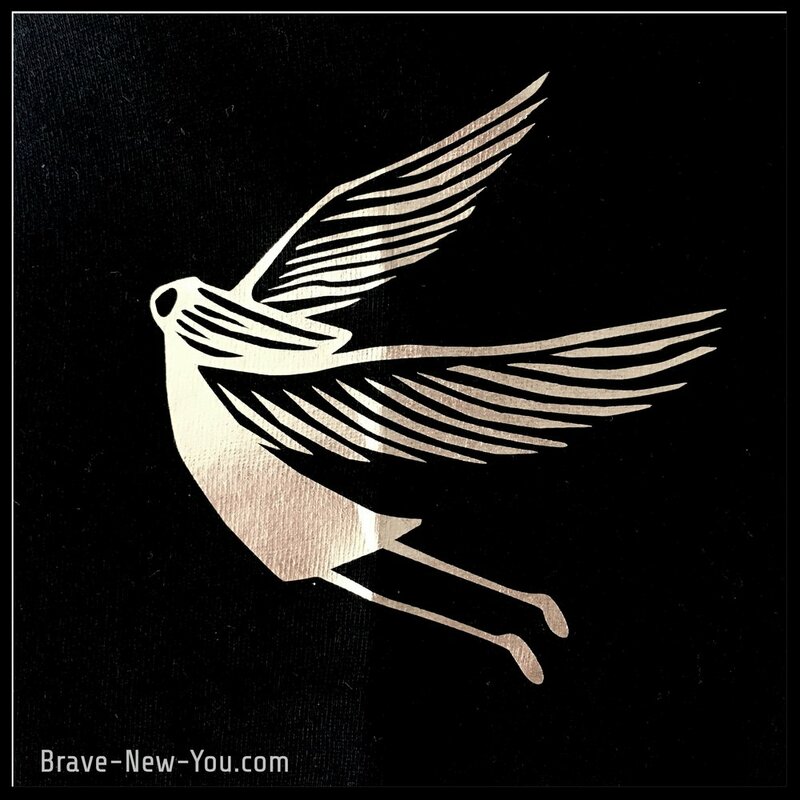 "RISE" is the latest design in our collection and features Brave New Girl with wings.